In my last post, I claimed I was finally transitioning into fall cooking, welcoming comforting soups, squashes, and all the fallen leaves that go with it. 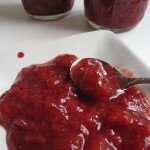 So here I am writing about tropical fruit and strawberry jam. 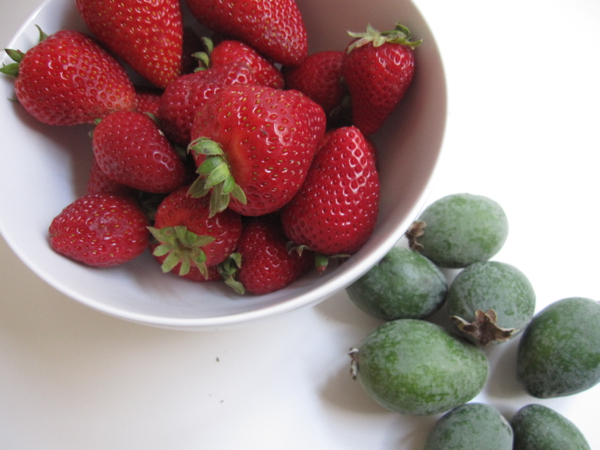 But guess what – pineapple guava, discovered at the farmer’s market last weekend, is a fall fruit! And after doing a bit of research, I discovered that it is indeed ripe when it falls from the tree. 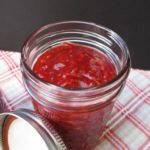 In California, we are still seeing fresh strawberries at the market and as you know from my previous jam posts – strawberry and apricot raspberry – I love making small batch jam. 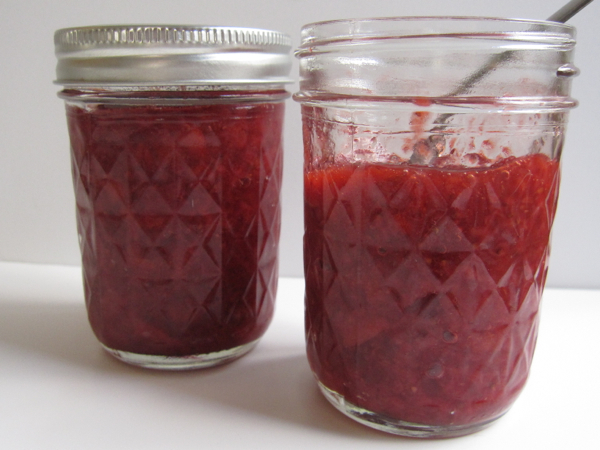 After a quick discussion with another blogger, Amber Stott of Awake at the Whisk, on Facebook and learning of her post about applesauce made with pineapple guava, I quickly thought about experimenting with strawberries and pineapple guava in a jam. Despite my usual hectic schedule, I squeezed in a quick jam session in between activities one afternoon with good results. I quickly cut up the strawberries, scooped out the guavas, gathered a bit of sugar, orange liqueur, lime zest, and lemon juice and let it all do it’s magic. Twenty minutes later I had two small jars of tropical tasting strawberry guava jam just waiting for the next morning’s English muffins. Do you make jam? If yes, what kind of fruit is your favorite and do you can it or just make refrigerator or freezer jam? Leave a comment and share your jam stories! 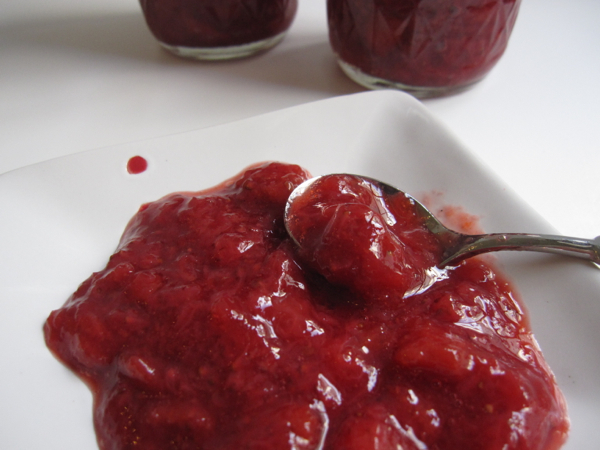 A tropical twist on strawberry jam using an unusual fall fruit known as pineapple guava. Slice the strawberries and extract the pulp from the guavas by cutting them in half and scooping it out with a spoon (this is the most time-consuming part of the process but if you only make a small batch, it won't take long at all). Combine the lemon juice and fruit in a heavy bottomed saucepan and cook on medium heat for about 7 minutes while it breaks down and releases its juices. Once it is boiling and juicy, add the sugar and zest (and liqueur if you are using), turn down to medium low and continue to boil and reduce for another 15 minutes or so. You’ll feel as you mix it that the liquid is reducing and you’ll see on the sides of the pan that the level goes down about 1 inch in volume (depends on size of your pan of course). As you mix occasionally, skim off the white foam that appears. Transfer it to glass jars and then refrigerate. You’ll need to use it up in a week or two. That won't be a problem. Article Review your food look attractive. I think, to find time to cook for you. OMG! This looks delicious, i’m saving the recipe and your blog is adorable! I love your banner. I’m stopping by from SITS & i hope your having a great Monday. I have not had the pleasure of eating pineapple guava – this jam sounds amazing. What a great way to brighten up a dark morning! Plum jam has been my favorite this year. I make fridge jam since we gobble it up quickly. One of these days I’ll start canning for longer storage, though. 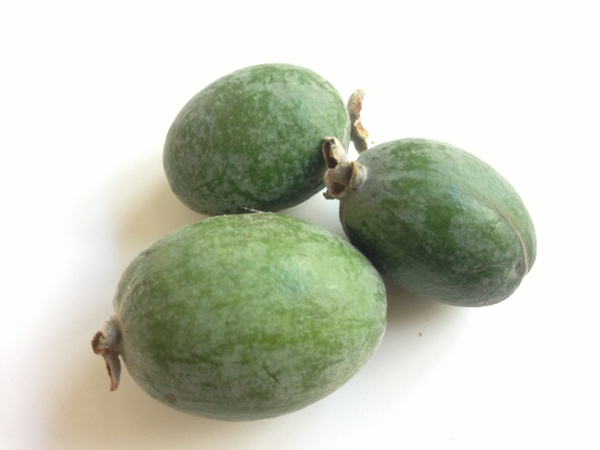 It was actually you that motivated me to get more adventurous at the farmer’s market – I remembered reading about you trying jujubees – saw those at the market and these guavas and decided to be a little more adventurous! I think I’m over my fear of canning but I just don’t have the time. So fridge jam it is for now! My grandmother canned everything, and my aunt is constantly reminding me I need to start canning. Time is definitely a factor…someday soon I hope. Thanks for coming by to visit – I still have a smile on my face from the name and concept of your blog. It is so descriptive of how I’ve been feeling – MUDDy and Fried!!! How about making some of that delicious looking jam for your 39 year old mother? Grandma used to make jams but I never learned how. I keep hearing about all the things Grandma made – didn’t any of you watch and learn!!???? Yes, I will make extra next time, I promise! Thanks Liz! Wouldn’t it be fun to organize a group of bloggers to hit the markets together and then head over to a big kitchen and create a meal together? Hmmm – might have to turn this into a real event – I get excited just writing about it! Thanks for coming by to visit! 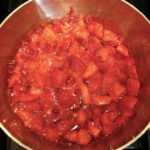 Pineapple guava – have to try – and love the combo in your jam…California markets are full of surprises this time of year. Our berries still look good as well. 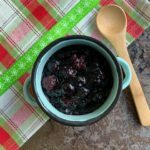 Holy yum – I’m going to file that – LOVE it! I’m wishing I had time to go to the market again today for another bag of guavas but alas – no time. Thanks for stopping by! Holy yum… this sounds absolutely delish~what a great combo of ingredients! Will have to try 🙂 Hope you are thoroughly enjoying your weekend; stopping by from SITS today! What a lovely color. I would imagine that flavor transports you to Hawaii, too. Lovely post, Beth! Mahalo Carol! Yes it did transport me briefly, especially with our cloudy rainy weather last week. Back to blue skies and sun today! Beth, I love that you squeezed in a quick jam session! And one dedicated to the pineapple guava, no less. So delicious! I’ve got a fridge full of these fruit right now, and look forward to a new way to use them. 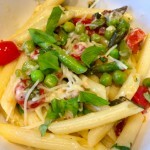 I’ll be making this recipe post haste! I love the idea of pairing them with strawberries. Thanks for all the motivation the other day – I loved your applesauce post. I adore that applesauce “colored” your childhood. Let me know how your jam comes out! Hope it helps empty that fridge for you!